Catholic News World : Pope Francis said we must learn to let ourselves be consoled by the Lord, leaving behind our grudges and complaints. Pope Francis said we must learn to let ourselves be consoled by the Lord, leaving behind our grudges and complaints. 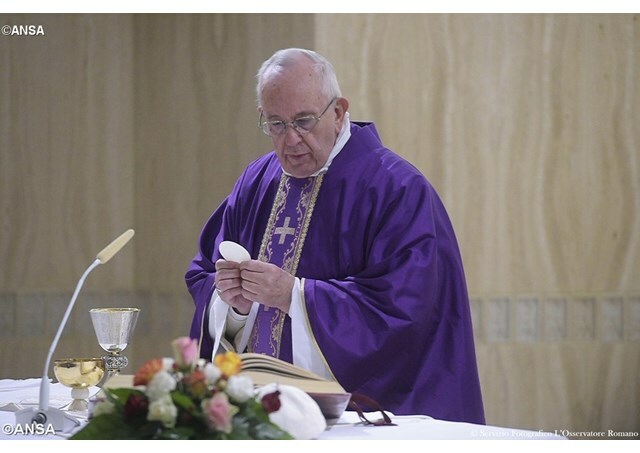 (Vatican Radio) At his morning Mass at Santa Marta on Monday, Pope Francis said we must learn to let ourselves be consoled by the Lord, leaving behind our grudges and complaints. Reflecting on the day’s first reading from the prophet Isaiah, he said the Lord has come to console us. Just as the first disciples could hardly believe the joy of the Resurrection, we often find it hard to let ourselves be consoled by the miracles that God performs in our lives. Pope Francis continued by explaining that we prefer to bear grudges and to stew in our own juice because in that way we are masters of our own hard hearts. Like the paralised man, we prefer the ‘bitter root’ of original sin than the sweetness of God’s consolation. Such bitterness always leads us to complain, the pope said, with a constant whining as the soundtrack to our lives. He described the prophet Job as the Nobel prize winner of whiners, who complained about everything that God did. Pope Francis also recalled an elderly priest he knew who complained so much that his companions joked about what he would say to St Peter, upon arriving in heaven. They said his first thoughts would be to ask about hell and to complain that there were too few people denied salvation. Faced with such bitterness, anger and complaining, the pope said, the Church repeats that we must have courage, just like the friends of the paralised man, who didn’t think about the reaction of the scribes, but only about helping their friend in need. The message of today’s liturgy, Pope Francis concluded, is to let ourselves be consoled by the Lord, to be stripped of all our bitter egoisms and complaints. Let us examine our consciences and look into our hearts, he urged, asking if there is any sadness or bitterness there. Do we praise God, or do we always have something to complain about? Let us pray for the grace of courage, he said, asking the Lord to come and console us.